This is one of those rare opportunities to see an Ivey Award winning production that I missed. Illusion Theater adapted the classic pioneer novel My Antonia for the stage a few years ago. They've recently remounted the production with a mostly new cast and taken it on tour around the Midwest, with a short stop at the shiny new Cowles Center in downtown Minneapolis this weekend. Since I missed it the first time around I was eager to see it this time. I read the book in high school or college, which is to say so long ago that I remember next to nothing about it, other than that I liked it. This is a beautiful production, one of my favorite plays of this new year so far. Willa Cather's story and language are beautifully adapted by playwright Allison Moore, the characters are brought to life by a talented company of actors, many of whom play several different roles, and beautiful music (just a piano, cello, and violin) accompanies the action and helps to define the setting and emotions of the piece. My Antonia tells the story of a young immigrant girl in late 19th century Nebraska, through the eyes of her childhood friend Jim. The adult Jim narrates the story as he's returning home to visit, and his memories of his time on the frontier and the girl that he loves come to life on stage. Joel Liestman is a wonderful narrator who seamlessly steps into the action to play various characters, from Antonia's father, to Jim's teacher, to Jim himself at the end of the play. Dustin Bronson portrays the young Jim from the age of ten through his college years, hopelessly in love with the older girl but meant for a life that's bigger than the small town they live in. There's a continuity between Joel and Dustin's performances; it's easy to believe they're the same person at different stages in their life. 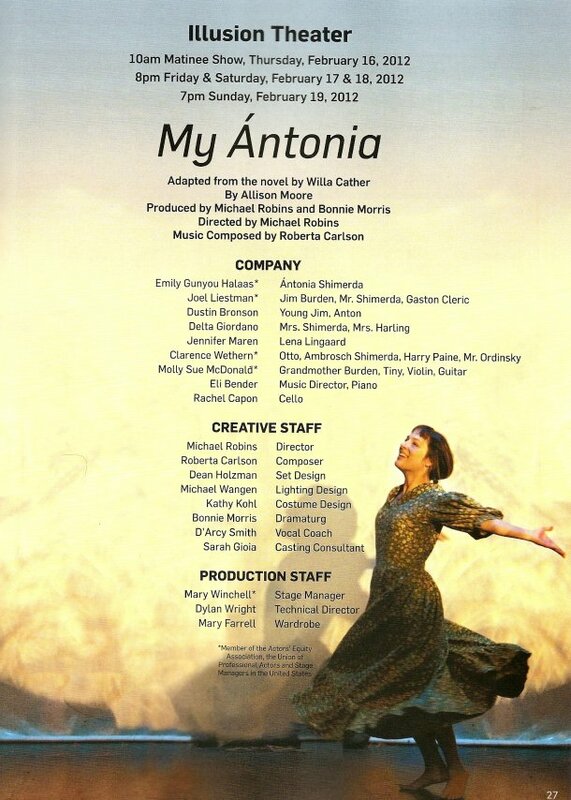 Emily Gunyou Halaas (who starred in another story of pioneer life, The Master Butchers Singing Club) beautifully portrays Antonia in her journey from young immigrant girl, enthusiastic about everything, to a hard-working pioneer woman who still retains that love of life, but in a quieter way. Jim and Antonia are two people who love each other deeply and have a great effect on each other's lives, even though they end up on vastly different paths. The Nebraska prairie will always join them together. (To quote one of my favorite musicals Wicked, "So much of me is made from what I learned from you, you'll be with me, like a handprint on my heart.") The rest of the cast fills in the story playing various roles, changing from one to another just by donning a different hat or accent. The accents, by the way, are excellent - Czech, German, Norwegian, a cacophony of voices from the past. I found myself (unsuccessfully) fighting back tears through much of the play, and I'm not even sure why. Mostly I blame the music (composed by Roberta Carlson with musical direction by Eli Bender), which so specifically brings you to that time and place, tinged with memory. The language of the play (which I assume was largely taken from the book) paints such a picture I that almost wanted to close my eyes to better see it, but then I would have missed the simple but effective images of waving grass or a plow against the sunset projected onto the backdrop. All of the pieces added together create an experience that is so nostalgic and wistful. It makes me feel nostalgic for a past I never knew, but that is in me somehow. My ancestors immigrated to Minnesota from Germany and Poland in the 19th century, so I felt like I was watching my own history. I have that same feeling of connection to Little House on the Prairie. Laura Ingalls Wilder's experience was probably no different, no more important or exciting, than anyone else's who was living on the frontier in those times. But she wrote it down, which my ancestors did not, so it's all many of us have to remember that time in our collective history. Willa Cather also wrote about those times, and I think it's wonderful to bring this work to the places where it happened, to people who have a connection to it. One of his friends tells Jimmy that he has a romantic view of country life, because he only lived on the farm for a short time and didn't have to work, and lived most of his life in town. Maybe that's why the story has such a nostalgic, romantic feeling, but it also portrays the hardships and struggle that frontier people went through. I've been told I need to check out Illusion Theater, but this is my first time seeing one of their productions. Judging by this beautiful piece I will be seeing them again. There are only two more performances on this stop of the tour - tonight (Saturday) and Sunday. There were plenty of empty seats in the Goodale Theater at the Cowles Center last night, so if you're looking for something to do this weekend, I would highly recommend this. Click here to find more information on this weekend's performances, as well as future stops on their tour around the Minnesota. It's a show that will make your heart ache, in the best possibly way.